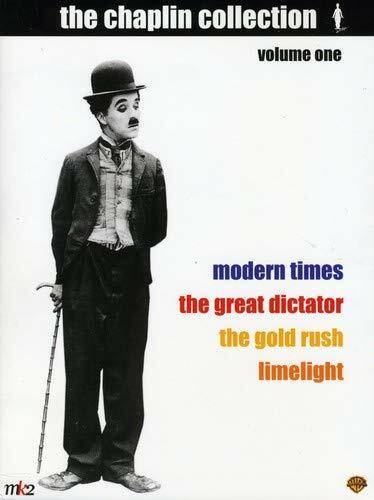 "The Gold Rush" "Modern Times"
Buy just "The Gold Rush"
Buy just "The Great Dictator"
From the quintessential silent comedy of "The Gold Rush" to the format's ingeniously "progress"-mocking last gasp in "Modern Times," from the brilliant satirical serio-comic balancing act of "The Great Dictator" to the forgivable over-sentimentality of "Limelight," Charlie Chaplin remained, for his entire career, a leading light in cinema. The four titles just mentioned have all been out on DVD before, but watching them in their new, immaculately remastered versions in The Chaplin Collection (Volume One, with more to follow), I found myself bowled over anew. I was laughing out loud constantly -- and at times uncontrollably -- at Chaplin's truly innovative slapstick and gestures-speak-volumes body language while feeling more emotionally invested in his voiceless characters than I've been in 95% of the new releases I've reviewed in the last 10 years. When I wasn't completely sucked into the movies themselves, the technical achievements of this DVD collection left me agog. Not only are all the digital transfers newly minted from pristine prints loaned by Chaplin's family, but the soundtracks have been richly remastered in 5.1 Dolby as well (while offering the original mono as another option). Each 2-disc box set (one dedicated just to the film) is thick with extras (including introductions by Chaplin biographer David Robinson) that genuinely add meaning and insight to the experience of watching the films (I had no idea Chaplin's productions were such colossal undertakings that often took more than a year to complete because of his perfectionism). Those extras are noted below in the reviews of the individual films and discs. However, each of them includes the following: box notes on premiere dates and locations, scenes from all the films (present and upcoming) in The Chaplin Collection, galleries of hundreds of production stills, behind-the-scenes stills, posters and design sketches, and multiple spoken (3) and subtitled (6) languages. Chaplin's Little Tramp heads for the Klondike looking to strike it rich and runs into all kinds of trouble (bears, outlaws, blizzards, starvation, unrequited love) in this masterful "dramatic comedy." Curiously melancholy yet packed with laughs, the picture's funniest moments aren't even the famous ones (the roll dance, Chaplin and a prospector scrambling to keep their cabin from tipping off a cliff). "Gold Rush" is the perfect introduction to Chaplin films, for those unfamiliar. Both the newly restored 1925 version (96m) and the pared-down, narrated 1942 release (69m) are included on the two-disc set. But the original (featured on the extras disc and accompanied by a new piano recording of the 1925 score) is the masterpiece, exhibiting a charm that is diminished by Chaplin's bedtime-story narration in the '42 version. Besides, those 27 cut minutes are good stuff. An engrossingly detailed introduction by David Robinson that catalogs locations, shooting problems, personal problems, logistics and details of the 1942 revival. "Chaplin Today - The Gold Rush." One part of a curious multi-disc documentary, produced exclusively for this DVD collection by Frenchman Serge Le Péron, that is good only in fits and starts -- mainly because each one focuses on Chaplin's influence on obscure modern filmmakers. This one features interview footage with actress Georgia Hale (who replaced Chaplin's pregnant teenage wife in the role) and making-of goodies, but spends too much time chatting with African filmmaker Idrissa Ouedraogo, who was working on a gold prospector movie in 2002. Trailers, photo & poster galleries. This topical, lighthearted skewering of industrialization during the Great Depression is the last screen appearance by the Little Tramp, who finds himself working as an assembly-line cog before he gets fired (for gumming up the works in the famous scene that lands him literally inside the factory machine). Taking a series of odd jobs where he can find them -- a department store night watchman who roller-skates around the store when no one is looking), a waiter (who sings for his patrons in gibberish Italian, the first time Chaplin's voice is heard on film) -- the little fellow also falls in love with a seductive, impish young street urchin (the personality-popping Paulette Goddard, soon to be Chaplin's on-and-off lover for 10 years). This flick is thick with comedic and narrative brilliance as Chaplin mockingly introduces sound to his repertoire, although only through sound effects and mechanical devices. Except for Chaplin's "nonsense song," any voices heard come from gadgets, as in the scene in which a sales pitch is given on a portable record player even though the salesmen are there in the room to demonstrate the product -- a Rube Goldberg contraption for eliminating lunch breaks by feeding workers while on the assembly line. The thing is tested on the Little Tramp with disastrously, hilariously malfunctioning results. Another installment of "Chaplin Today," with European filmmakers Luc and Jean-Pierre Dardenne, who have no discernable connection to Chaplin (although they try to draw parallels to (and the documentary wastes time showing scenes from) their 1999 film "Rosetta". For "Modern Times," this feature should have at least included someone with knowledge about the film's mockery of American industry (especially the Ford Motor Company). A 1967 Cuban documentary short about peasants seeing their first movie -- "Modern Times" -- thanks to a traveling projectionist. A poor print of the "nonsense song" all by itself for some reason, followed by a crisp version with Karaoke subtitles (strange, but funny). A 1931 US government propaganda documentary singing the praises of the Machine Age. It's long (42m) and silent (no added music or anything) and gets tedious. But it has its hilarious gems of moments, like the "daily dozen rhymes based on the Women's Bureau Standards" for keeping women happy and safe in factory jobs. A deleted scene, trailers, photos & posters. An inspired stroke of dark-but-hopeful socio-political satire, this film demonstrated Chaplin's, conscience, courage and pluck in the face of American "neutrality" without forgetting for a minute to be funny. Released more than a year before the U.S. entered World War II (and begun almost two years before that), it addresses fascism and the Holocaust (or at least what was known of it at the time) and ruthlessly mocks Adolf Hitler in its story of a brutal dictator with a Little-Tramp-like mustache and a look-alike Jewish barber who ends up impersonating him in a strange twist of fate. Poignant and at times even chilling, yet still a laugh-riot. "The Tramp and the Dictator," an hour-long Turner Movie Classics documentary that puts the films in vivid historical perspective (Hitler, McCarthyism, etc.) and incorporates recently discovered color home movies shot on-set by Chaplin's brother Sydney. An in-depth look at "The Great Dictator" and Chaplin's life, this TV special doesn't do a great job of fulfilling its stated purpose -- paralleling the lives of Chaplin and Hitler (who were born only days apart) -- but that's just a gimmick. It does include Nazi propaganda newsreels disparaging Chaplin as a Jew (but skips over Hitler's rise from impoverished soldier to political firebrand), covers Nazi-style nationalism in the US in the 1930s, and notes the similar skewering of Nazi sympathizer Henry Ford in "Modern Times." Competently narrated by Kenneth Branagh, the piece features interviews with retired film critics, directors, screenwriters and actual Hitler subordinates (among others), and it weaves the tale of the film's unprecedented 559-day shoot -- which included entire sets torn down then rebuilt for reshoots when Chaplin wasn't happy with the way some scenes turned out! Syndey Chaplin's home movie footage in its entirety (25m) including shots from the filming of an unused final scene. A screamingly funny deleted scene from "Sunnyside" (1919) of Chaplin as a barber, giving a gentleman a very poor shave in a broken barber chair. The great comedian's bittersweet, sentimental swan song is a film for which Chaplin not only wrote and directed, as per usual, but also had a hand in composing the film's Oscar-winning score (in 1972, when the film was finally released in L.A.). Charlie, in a subtle but heartbreaking performance, plays the self-referential Calvero, a once-famous Vaudeville-style clown in turn-of-the-century London who has fallen on hard times and hard drinks. After rescuing a suicidal, deeply troubled ballerina (Clair Bloom), he hopes to taste the stage life again by mentoring her to stardom. Highlights include Chaplin's hilarious violin-and-piano duet with Buster Keaton ("If anyone says it's like old times again, I'll jump out the window! "), the only man who could ever truly compete with Chaplin as a silent film comedian. The introduction by biographer David Robinson, which provides historical context (Chaplin originally wrote it as a novel, meant to be the starting point for the screenplay) and personal context (many supporting roles were played by members of his family). "Chaplin Today - Limelight," which takes a good 10m to warm up, then finally goes into Chaplin's expulsion from the US under McCarthyism. Weighed down with longer-than-necessary clips from the film, this installment lacks real informational content except for a new interview with co-star Clair Bloom. Bernardo Bertolucci is interviewed as well, but it's just for his interpretation of the film. A great but unfinished screwball short called "The Professor," in which Chaplin played a flea trainer -- a gag he reused in "Limelight". Plus a deleted scene, the complete musical soundtrack on its own, Chaplin home movies from the 1950s, and, rather pointlessly, audio of Chaplin reading chapters from the novel mentioned above. New digital transfers from "Chaplin family vault picture and audio elements" at times bring a crispness to these films that probably hasn't been seen since they were new -- and in the case of the sound, not even then. The scores (and dialogue on talkies) can be experienced in the original mono or in wonderfully full 5.1 Dolby remasters. But the transfers are imperfect, with some scenes suffering from slight digital shadowing and other anomalies. The problem isn't a distraction, but for all the effort that was put into this collection, you'd think somebody would be on the quality control for the image.